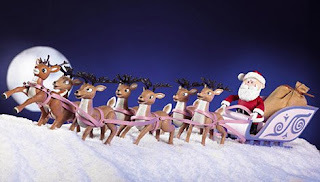 Since Santa's reindeer work so hard on Christmas Eve, we think it's really important they get a treat:). So, we make a fun little treat to spread on the lawn Christmas Eve. I pour the oats into a larger bowl so that the children can scoop them out easily. Each child gets a sandwich sized bag. I have the children scoop some oats out of the bowl and pour them into the bag. Then I let them add glitter, or colored sugar. I also have a little poem that I give the children to put in the bag so that when Mom & Dad get the "bag of stuff" they know what it is. On Christmas Eve, sprinkle Magic Reindeer Glitter on your lawn. 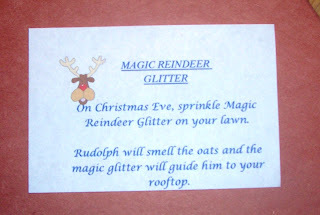 Rudolph will smell the oats and the magic glitter will guide him to your rooftop. Note: Got a comment today that I thought I should share. A reader noted that glitter is harmful to birds and squirrels. The reindeer food will be just as colorful with some colored sugar. Thanks. Of course, the poem I show will have to be changed. 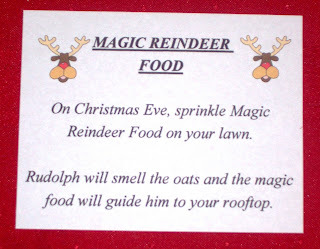 I'll probably just write Magic Reindeer Food. December 18, 2008: Today we made the reindeer food in class. I used the sugar crystals and I will say, we didn't have quite as much mess either. The colored sugar doesn't stick to the surface as much as glitter does. I had brought 5 different colors, and in teacher way I told the children then could pick a color and add it to the oats. In kid way they wanted to know if they could use all the colors--so why not. So this year our reindeer food was oats, and red, pink, blue, green, and yellow sugar crystals. Ooooh! I love magic reindeer food! You should have known- I'm like a big kid and I get excited over the small stuff!! Anyways, that is so funny you just posted that, because my oldest just asked me where the reindeer food was so that she can get ready for Christmas Eve. I guess I better get on the ball and make some. Wonderful presentation. This is the reason I visit your blog so often. Thanks. DO NOT USE GLITTER!!! dangerous to birds and squirrels :( use colored sugar instead! !